Learn the fundamentals of movement, balance and more through our Developmental Coordination Disorder (DCD) movement program. 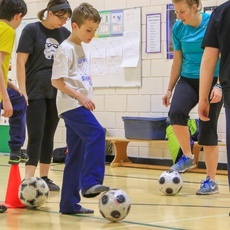 This program will focus on learning fundamental movement skills (walking, skipping, hopping, jumping, running, throwing and kicking) through play-based programming with skills broken down into small steps and reinforced through small practice activities and then larger games. This program was designed in consultation with experts in the DCD field. If your child has not participated in an Amicus or social skills program through Foothills Academy before, a Parent Intake Form must be completed. To begin the intake process, contact the Community Services Intake Assistant at 403-270-9400 ext. 252 or download the Parent Intake Form and send it in.